South Australia is the pinnacle of beauty, vast oceans, salt lakes and the Flinders Rangers. These are the Aussie travel secrets South Australia. Southern Ocean Drive rivals the Great Ocean Road. Taking in Kangaroo Island and the gorgeous towns of Robe and Goolwa , this drive offers equal beauty and plenty of incredible food producers along the way. The Yorke Peninsula is a finger of land with Innes National Park at its tip, and looks a bit like Italy’s boot. Seafood is bountiful, surfers head for rugged beaches like Pondalowie and Browns, and shipwrecks lie submerged offshore. Walking is one of the best ways to explore this coastal frontier: the Yorke is a 500-kilometre collection of trails stretching from Port Wakefield to Moonta Bay, a once-booming copper mining town that now lures families with its waterfront Splash Park and homemade gelato. Walk the brilliant white hard surface of salt at Lake Gairdner (160 kilometres long and 48 kilometres wide) in central SA and look at the horizon where the lake bleeds seamlessly into the sky. You can hike for days across it and it is so flat and vast it’s used for land-speed record attempts. Our little secret: Kangaroo Island is home to the purest strain of Ligurian bee in the world – even purer than in Liguria! Kangaroo Island is truly a food, wine, beer, cider and gin lover’s paradise, just a short 20-minute flight from Adelaide. Guests on Kangaroo Island Odyssey’s new luxury three-day food and wine tours can immerse themselves in the island’s renowned produce, taste the most amazing boutique wines and spirits, and dine in some of the island’s most beautiful locations. The personally guided tours, which have itineraries to suit every season, explore the island in luxury 4×4 Mercedes Sprinters taking small groups of up to eight people. Staying in luxurious coastal accommodation at either Life Time Private Retreats or Sea Dragon Lodge, guests visit Islander Estate Vineyard, KI Spirits, Island Pure Sheep Dairy and Island Beehive. Plus don’t miss the gastronomic delights prepared by Hannaford and Sachs at their amazing dining locations such as the Enchanted Fig Tree, the Shearing Shed and Beachside Taverna. FOR AT READERS: Discover Kangaroo Island Odysseys new food and wine tours – available now! Our little secret: Edge-of-the-world escape offering the chance to wonder at untouched horizons. The setting was, of course, spectacular on the southern coast of Kangaroo Island, overlooking Hanson Bay. But the obstacles, such as the incredible complications of designing such a place, could have left other mortals in the fetal position. But James and Hayley Baillie knew – and truly, madly, deeply believed – that if they built it, they would come. And so they have, from day one in 2008, when construction of this lodge-cumarchitectural wonder was completed, with a fresh, very contemporary feel by island-born architect Max Pritchard. “It was the perfect cocktail of all our previous experiences, combining our joint loves of nature, design, premium lodgings and the sea,” says James. A decade on (Southern Ocean Lodge will turn 10 in March 2018), with the threat of bushfire behind them, a raft of awards and a constant wave of guests, it feels like the journey has only just begun. FOR AT READERS:Stay three nights or more on the Southern Ocean Lodge ‘KI Classic’ package and receive a complimentary bottle of French Champagne on arrival – exclusive to AT! Our little secret: If you’ve never looked at the night sky through a telescope then this is a fantastic place from which to observe the moon, planets, stars and nebula. 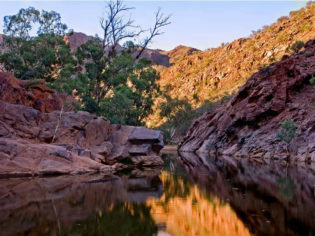 Arkaroola Wilderness Sanctuary is a privately owned 610 square-kilometre conservation area in the far north of the Flinders Ranges. This ancient and rugged part of the Flinders is so significant scenically, geologically and ecologically that it is protected by its own Act of Parliament, the Arkaroola Protection Act (2012). Travel by 4WD from the depths of ancient sea-beds to the roof of the Flinders on the exciting Ridgetop Tour. Watch for the shy yellow-footed rock wallaby by a quiet waterhole, or take a scenic flight over the ridges and Lake Frome. Tour the star-laden night skies from one of our professionally equipped astronomical observatories. Explore this unique part of the country via our network of walking trails and self-drive 4WD tracks. Arkaroola is family owned and operated ensuring a home-away-fromhome experience. There is a range of accommodation and camping, a licensed restaurant, fuel and repair facilities. FOR AT READERS: Step back 1.6 billion years to Arkaroola Time with special deals online.